Providing higher-quality job placements. Joanne’s team is applying more time and energy to find individual solutions to client barriers. Fewer clients mean employment case managers spend more time getting to know each client, understanding their unique situation and goals, and making better job matches. The YMCA International Services Center is also implementing a more assertive approach to employer prospecting. Engaging a front desk volunteer who doesn’t mind making cold calls to new businesses is resulting in higher-paying job leads. Employment specialists are researching online job openings with current employers to find positions that require additional skills, pay better, or have more advancement opportunities that go beyond “typical” placements. Rethinking vocational training. 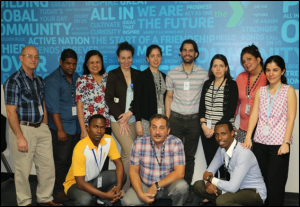 In FY2016, YMCA International Services Center moved the Vocational Training Program in-house by hiring a full-time Vocational Training Liaison who screens potential training participants, reviews their background experience, and makes recommendations for trainings. Previously, the RES team referred clients to a refugee services office at partnering organization Houston Community College (HCC). HCC continues to be a preferred vocational training partner for YMCA, and together they are working on solutions to provide continued learning opportunities that accommodate clients’ work schedules. For example, they recently piloted bilingual HVAC and welding classes on the weekends for Spanish-speaking clients. It’s been successful so far—there was a 100% successful completion rate among their first weekend welding cohort! What are your team’s priorities for the coming year? We’d love to hear your thoughts at information@higheradvantage.org. Cars, bikes and buses – oh my! Transportation is a common challenge for newly-arrived refugees, but you might find some inspiration from Lutheran Social Services of the Southwest in Tucson (LSS-SW) and their strategy for using donated bikes to help clients get to work. 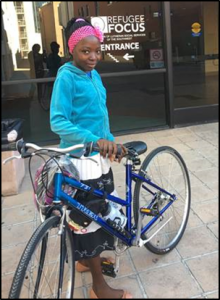 LSS-SW provides 1-2 bicycles per client household with employable adults, thanks to partnerships with Wheels for Kids and local Boy Scout drives. Both partnering organizations have provided donated, refurbished adult and child bikes. Bikes are never given to clients without appropriate safety equipment, including a helmet, rope lock, and brake lights. Safety information is reviewed one-on- one with each recipient, and bicycle safety classes are available through Pima County. Once a client has a bike, maintenance can be a challenge, but BICAS (Bicycle Inter Community Art and Salvage) in Tucson helps overcome that hurdle by training clients how to fix their bicycles. Clients are able to keep their bikes running and know how to perform basic fixes on their own. If you have a car or bike donation program in place, we’d love to hear about at it at information@higheradvantage.org. Haven’t found a community partner to help develop these resources yet? Start by googling terms like “donated bikes” or “bike classes” and see who is in your area – you might be surprised how easy it is to find great local partners! Are you someone who is extremely passionate about refugee employment? Higher is seeking to fill its Network Engagement Specialist (NES) position. The position is ORR funded through the Higher technical assistance grant. The NES will develop high quality technical assistance materials on promising practices in refugee employment to be disseminated through multiple channels. This position is a critical role in supporting and fully engaging the nationwide network of resettlement agencies, other refugee serving organizations, and employers. This includes working on strategies for the initial refugee employment and on longer term economic integration. The NES will have the opportunity to develop Innovative strategies for refugee employment and self- sufficiency. The NES will be responsible for all areas of online engagement including the metrics for each platform. The candidate must be strong writer. The position assists the Program Manager of Higher in developing technical assistance priorities based on information gathered during in-person trainings, webinars, TA requests, and other interactions with the Higher network. To read the full job description and apply please click here. Please share this link with your network. Registration for this event is limited and seating is on a first-come, first-served basis; please register today. Higher Network, let the great work you are doing in employment speak for itself through the art of storytelling. Please note that to register, participants will have to create a DOL account, if they don’t already have one. On August 21st I transitioned out of Higher and into a new role at LIRS, in which I’ll be managing a corporate partnership focused on creating sustainable career opportunities for refugees. It has been a fantastic 2 years with Higher, and I am grateful to have had the opportunity to support you in the critically important work that you do in helping refugees become self-sufficient and pursue their dreams. -Never underestimate the value of connecting and collaborating with your peers. We hear again and again from attendees at our events that while the training we provide is extremely helpful, the most valuable thing people get out of being connected to Higher is the opportunity to connect with peers. This has been true for me too! The opportunity to get to know many of you has added a lot of depth to my expertise in refugee employment. Thank you! -Don’t let short-term discouragements get you down. It’s easy to be discouraged in the work that we do and wonder if we are really making a difference. Keep in mind though that refugee employment is like gardening- if you keep doing the right things, the garden will eventually grow. So keep showing up, keep providing excellent services for your clients, and I promise you that the harvest will come. It won’t be long before you have some amazing success stories to tell (on the Higher blog of course)! -There are ALWAYS opportunities! Our work can be a roller-coaster. Funding levels, arrival numbers, refugee populations and the economy will always be changing. I started my career in refugee employment in 2010 during the Great Recession but chose to ignore the bad news on TV and believe that America is in fact “the land of opportunity.” This positive attitude and a commitment to creativity in my approach to finding opportunities for myself and my clients has always served me well. There will always be challenges to overcome. The good news is that we are experts in overcoming challenges. That’s what we help our clients do every day! So keep your head up, keep that smile on, and keep those business cards in your pocket! The best is yet to come. I believe that! On a final note, if you have a passion for refugee work, employment services experience, and writing/tech skills, I would really encourage you to apply for my former position. You can find the job description for the Network Engagement Specialist position here. Thanks again for a great 2 years!